Subject: Should I Buy Ferrari Stock After Q4 Earnings? Ferrari NV (NYSE: RACE) is set to report earnings on Tuesday, Feb. 2. Analysts predict the Italian luxury automaker earned $0.38 per share during the fourth quarter of 2015. Despite reporting a 22% jump in profit during the third quarter, the Ferrari stock price is down 27.5% since its highly anticipated debut last fall. On Oct. 21, the Ferrari IPO raised $893 million by selling 17.2 million shares for $52 each. According to Renaissance Capital, a manager of IPO-focused ETFs, the deal was the fourth-largest IPO of 2015 and the largest from the consumer goods sector. On Oct. 28, shares of RACE closed below the IPO price at $51.87 after four straight days of losses. The stock has cratered 23.1% since and closed at a new low of $39.89 on Jan. 20. That coincided with the Dow Jones Industrial Average's drop of 1.6% that day. Wall Street has been divided on Ferrari stock since its debut three months ago. Bank of America Merrill Lynch said last year that Ferrari's strategy of limiting supply to increase demand will be the company's biggest long-term boon by bolstering exclusivity and giving management control over sales. But other firms like Evercore Partners Inc. (NYSE: EVR) rate Ferrari stock a "Sell." 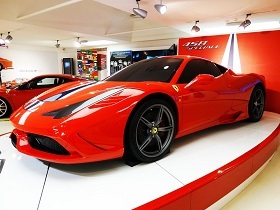 They assert that Ferrari is a car company rather than a luxury company and therefore won't be able to fuel brand-based growth like Prada or Harley Davidson. After all, about 57% of Ferrari's assets consist of brand value rather than physical assets like production plants. With all of these divisive opinions ahead of Ferrari's second-ever earnings report, investors are wondering if they should buy shares now that they are trading at just $40.54. Is Ferrari Stock a "Buy" in 2016? We recommend avoiding Ferrari stock until volatility in the IPO market settles down. You see, the Dow Jones Industrial Average's 6.6% plunge in August scared off private companies planning to go public. There were 17 IPO withdrawals during the third quarter – the most for that quarter since 2012. That fear pulled many newly issued stocks lower. By the end of the year, about 58% of all 2015 IPOs were trading below their offer price. Ferrari was one of many end-of-year debuts like Square Inc. (NYSE: SQ) and First Data Corp. (NYSE: FDC) that struggled to maintain momentum amidst the volatility. Initial volatility is always the biggest risk for IPO investors. In fact, Money Morning Chief Investment Strategist Keith Fitz-Gerald says newly issued stocks are always dangerous because they can cause huge losses for anyone who isn't a Wall Street insider. "IPOs are little more than a get-rich-quick scheme that's so heavily stacked against you that it makes the house odds in Vegas seem downright conservative," Fitz-Gerald said in June. A good rule-of-thumb for new stocks like Ferrari is to wait a few quarters before jumping in feet first. That's because you need to make the company prove it's worth your money by impressing you with a few solid earnings reports. Although Ferrari has demonstrated its profitability, you want to make sure it doesn't start piling up losses or start becoming less profitable. The only way to determine that is to wait for the Q1 2016 earnings report to come out in a few months. "IPO hype is based on what 'could be,' not what 'is,'" Fitz-Gerald said. "Many times management cannot make the jump, and you do not want to pay the price for finding out which is which." The Bottom Line: As one of the most anticipated IPOs of 2015, investors thought Ferrari stock had a lot of room to grow. But after gaining nearly 6% on its first day, Ferrari has fallen way below its IPO price as it suffers from an exceptionally volatile IPO market. We maintain that you shouldn't consider buying shares until at least the second quarter of 2016.